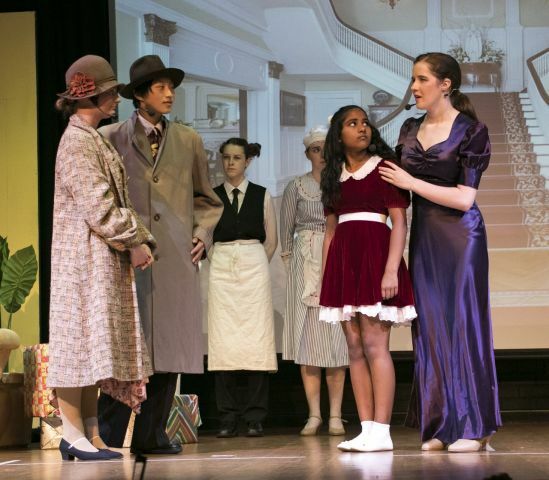 Optimism is important in any production – and those behind school productions have it a-plenty! Just ‘coralling’ kids for rehearsals is hard enough, and when that involves over seventy performers and musicians, organisation runs a close second to optimism. 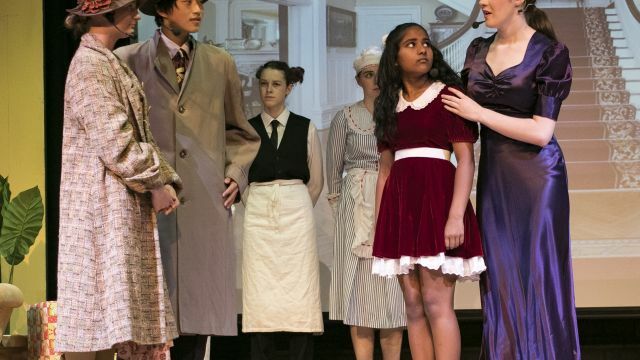 Add creativity, imagination, experience – and co-operation across the school community – and you have a good idea of why musical productions bring a sense of harmony and accord. This school production was no exception. Along with the performers and the directors, over thirty-six students and staff worked as designers, operators, publicists, backstage crew and ushers and canteen staff on production nights. Producer Rebecca Donoghue also pays homage to “the executive and many staff who give generously of their time to support the production”. Such involvement means that the excitement spills out into the wider school community resulting in full houses and lots of excitement. As was the case last Friday night when the orchestra, led by musical director Anthony Felton, struck up the overture and the curtain swished open to reveal the dormitory of the orphanage. The set, designed by Peter Maynard, took advantage of large screen images, easily movable flats and two raised areas either side of the stage – and the back-stage crew managed set changes swiftly and smoothly. Annie, played with modest hopefulness by Joanna Kodituwakku, introduced the audience to her fellow orphans with the quiet optimistic words of "Maybe" – and they then proved theircheekiness and mettle in the more jaunty "Hard-Knock Life", where Amelia Sinani shone as the cheeky, mischievous orphan, Molly. Hanna Wotton took on the role of their heartless, drink-affected ‘matron’, Miss Hannigan. It’s difficult for an adult to ‘play drunk’ effectively, even more so for a teenager, but Hannah’s depiction was very successful – and her voice, especially in "Little Girls", rang with adult clarity. Isaak Koorey showed similar vocal clarity and mature characterisation in his depiction of Oliver Warbucks. Annalise Pringle and Ailish van Noppen shared the role of his very caring and perceptive secretary/assistant, Grace, and Oliver Donnelly revelled in the role of President Roosevelt. Jason Teng and Natasha Hartley were suitably roguish as Rooster and Lilly, a stark contrast to the Warbucks household butler, Drake, played with excellent courtliness and pomp by Nathan Jenkins. Director Lisa Holt, assistant director, Julianne Cannon, and musical director, Anthony Felton obviously worked tirelessly with their students to a high level of focus and energy throughout the whole rehearsal periodin order to achieve such a bright, tight, ensemble production.